Museum.nyc, Shows.nyc and more are up for grabs. Already, you might view the auction as a success. The Broadway League Inc., which owns Broadway.org, bought BroadwayTickets.nyc before the auction started for $25,000. The domain name was supposed to be in the auction. With one day to go, bidding in the auction is fairly light with just 9 of the 24 domains receiving bids, and these with just one each. The top bid is only $510. However, this is typical of these types of auctions. They tend to attract bids in the final hours. Domains like Shows.nyc, Tour.nyc and Theaters.nyc should end up selling for much more. .NYC has held three auctions previously. A real estate auction pulled in over $70,000 in sales led by RealEstate.nyc for $21,300. A fashion auction had $90,000 in bids, although the top sale for $37,000 never closed. A tech-themed auction had $29,000 in sales. A great example of how to market a city top level domain name. 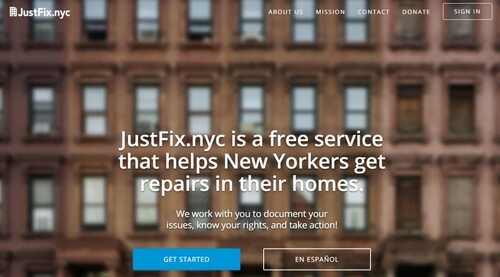 JustFix.NYC was the Brooklyn winner in the “Best of the Boroughs” contest. Despite a slow start for some domains, I’m still a fan of city new top level domain names. City names only have to create awareness in a small geographic area. This should be easier than global awareness. Still, it’s going to require usage and promotion to make people in cities that have their own domain name aware that they exist. I think .NYC’s Best of Boroughs contest is a great example of how to do this. The contest picked a top site built on .NYC from each of the five NYC boroughs: Manhattan, Brooklyn, Queens, Bronx and Staten Island. 40 are in Alexa’s Top Million, and they are real websites. Since most sites that use new top level domain names are relatively new, you wouldn’t expect to find many that get a lot more traffic than well-established .com sites. Typically, when I use DomainPunch’s Top 1 Million Alexa tool and search for specific new TLDs, the top ones are all spam sites. Indeed, .NYC has 40 sites in the top million. The top one is around #60,000, but the most important thing is that all of the domains look legit. This makes sense given the relatively high registration fees for the domains and the nexus requirement that registrants live or have a business in the city. Alexa isn’t the world’s best ranking source, but this is still an indication that use of .NYC domains is growing. I haven’t been to the city in a while, but I’m curious if people there have seen .NYC domains displayed in ads and on buildings in the city. It’s this offline promotion that will be critical to the domain’s success.